Visiting my family is always nice, and as an added bonus I get to spend some time with the Ghost of Crafting Past. For a long time my friends and family were the only ones who got to see the fruits of my creative labors, mostly in the form of birthday or Christmas presents, so when I visit them, it's a little walk down memory lane. 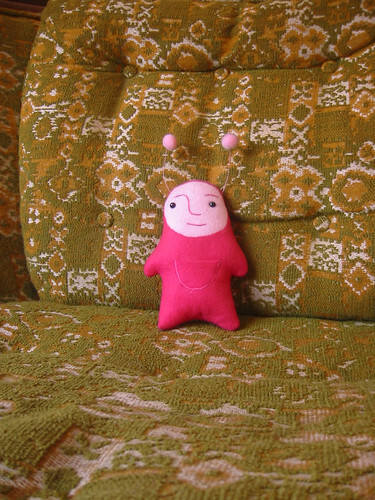 A few years ago it was all about felt and embroidery for me, so I made this little fellow for my sister. I especially like his antennae and his little pocket. Seeing stuff that I made Way Back When is fun, it gives me an opportunity to see how my style has changed over time and how I've been obsessed with the same weird stuff for quite a while. Ahhh, the holidays. I got a Print Gocco from Jeff, woo woo! Just in time for the manufacturer to announce that they will not be producing it anymore, or any of the supplies. Drat. Save Gocco! I'm planning to do little prints of my fellows. I think it will be super fun. Any tips or suggestions? Oh yeah! To those coming over courtesy of cute overload, I welcome you. I love that blog, they seem to have the same attitude about cute that I do - it hurts to love it but you MUST LOVE IT. i got to your site through a couple of hops...glad i did! i don't knit though, but i love your creations. do you make these for others? can i buy something from you??? He's a cute little guy! Please post the gocco prints of your fellows. As to tips, buy lots of screens and bulbs! Once you get started, it's pretty addictive. That is unbelievably cute! Are you going to create a knitted version for your next book perhaps?